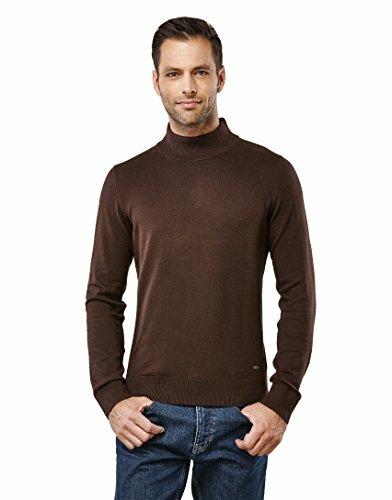 Modern, fine-knit pullover (slim-fit). It makes it a harmonious addition to both smart and casual outfits. The ribbed borders and logo above the bottom hem on the left round off the smart design. Each model of Vincenzo Boretti's designer collection of pullovers, sweaters, cardigans and troyers is a must-have asset for a man's wardrobe. With designed features and colors of classic mens fashion. Each model adds to a smart look for leisure everyday wear, a sophisticated look at the office or for special occasions like business-meeting or a wedding, when either combined with a simple pair of blue jeans or a formal shirt. A high quality knit workmanship especially at ribbed cuffs and hem allows the garment to keep its shape throughout the day. Additional elastic and breathable attributes due to the cotton mix make the sweater very comfortable to wear. Our fitted cut ranges from size small, medium, large to extra-large. If you have any questions about this product by Vincenzo Boretti, contact us by completing and submitting the form below. If you are looking for a specif part number, please include it with your message.